Elysis launching event. Photo from Justin Trudeau's Twitter page. 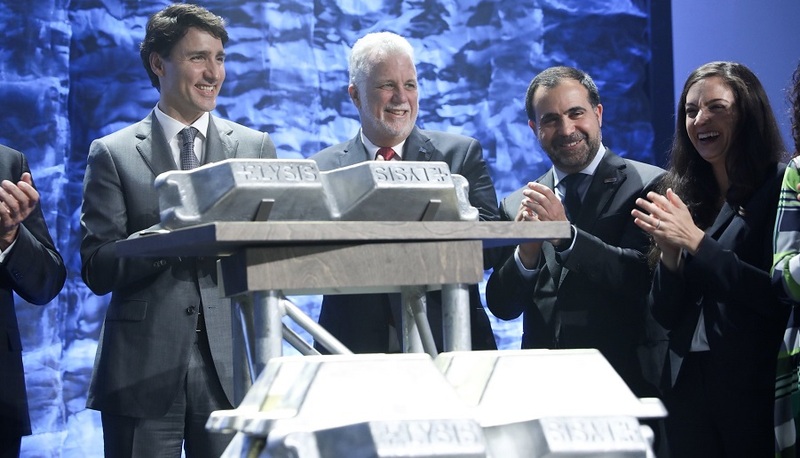 In an official event that included Canada’s Prime Minister, Justin Trudeau, Québec’s Premier, Philippe Couillard, and Apple’s CEO, Tim Cook, Alcoa (NYSE: AA) and Rio Tinto (ASX, LON:RIO) announced the launching of Elysis, a joint venture company whose goal is to push towards commercial production a newly discovered, carbon-free aluminum smelting process. At the event, executives from the companies involved explained that the innovative aluminum-making method produces oxygen and eliminates all direct greenhouse gas emissions from the traditional smelting process. As an example, they said that, if fully implemented at existing aluminum smelters, the technology could eliminate the equivalent of 6.5 million metric tonnes of greenhouse gas emissions in Canada. This represents an amount roughly equal to taking nearly 1.8 million light-duty vehicles off the road. The patent-protected technology was developed by Alcoa and is currently producing metal at the Alcoa Technical Center, near Pittsburgh in the United States, where the process has been operating at different scales since 2009. Apple has been involved in the project since 2015, when three of its engineers started a search for a cleaner, better way of mass producing the aluminum that is used in most of the company's devices. “This is a revolutionary smelting process that can deliver a significant reduction in carbon emissions. It builds on the key role aluminum has to play in driving human progress, by making products infinitely recyclable, stronger, lighter and more fuel efficient,” Rio Tinto’s Chief Executive, J-S Jacques, said. The joint venture plans to invest up to CAD40 million in the United States, which would include funding to support the supply chain for proprietary anode and cathode materials. According to the participating firms, such materials have been designed to last more than 30 times longer than traditional components. At today’s launching, it was also revealed that Elysis will directly employ 100 people and will be headquartered in Montreal with a research facility in Quebec’s Saguenay–Lac-Saint-Jean region. From there, industry experts will develop and license the technology so it can be used to retrofit existing smelters or build new facilities. In a press release, Alcoa said that Canada and Quebec are each investing CAD60 million in Elysis. The provincial government of Quebec will have a 3.5 per cent equity stake in the joint venture with the remaining ownership split evenly between Alcoa and Rio Tinto. Apple, on the other hand, is providing technical support and an investment of CAD13 million, while Alcoa and Rio Tinto will invest CAD55 million cash over the next three years and contribute specific intellectual property and patents.